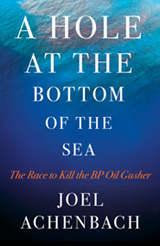 A Hole at the Bottom of the Sea will be published April 5, 2011. By Simon & Schuster. Click here for where to buy your copy. Print article This entry was posted by Joel Achenbach on March 3, 2011 at 8:13 am, and is filed under News. Follow any responses to this post through RSS 2.0. Both comments and pings are currently closed. “If I want to find out what's just happened, I’ll switch on the radio. If I want to find out why it happened, I’ll read Joel Achenbach. He’s the best explainer alive."